Organise your martial arts visit! For more than 30 years we have been hosting international martial arts visits: judo, karate, taekwondo, aikido, jujitsu…Eurostage works with martial arts clubs so that they can visit us with all of their members; they can train together, compete, do exams and live together for several days. Great international masters also visit us and hold open days for students from all over the world. The training sessions in Eurostage will allow you to combine a session in the morning, looking out to sea, feeling the sand between your toes, and several sessions in the afternoon, on the tatami. The tatami is located in a closed building, with spaces for individual withdrawal in the shade of mulberry and willow trees. Amidst this natural equilibrium, you can practise meditation. After your training session, you can go for a dip in the pool just opposite the tatami. 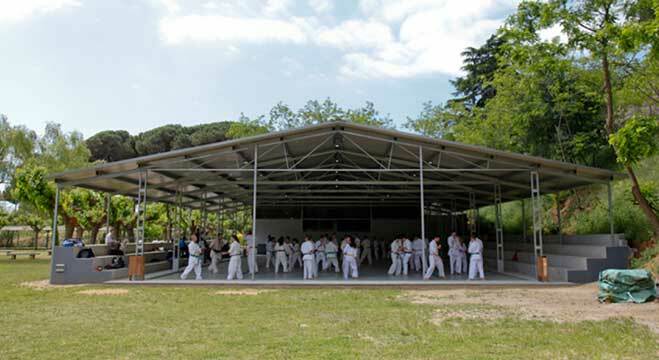 Programme: koshikan and shotokan karate and exams up to 5º dan. Teachers: Hans-Werner Sinnwell, European champion (81 kg); David Metger, German champion (73 kg); Jan Metger, German champion (90 kg). Heinrich Raimer (8º dan) and Andreas Modl (7º dan) will be with us again from the 18th to the 23rd of October 2014. Programme: Traditional karate; katas and self-defence; Kyu and Dan exams.